Surfing breaks many of us only dream of, holding over-sized cardboard checks while getting hosed down with expensive champagne, and using one of a countless number of free surfboards to shake away the swarms of girls that flock to them in masses. 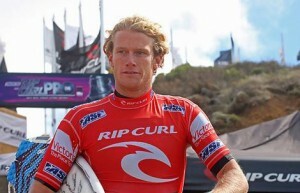 Such is the unfortunate perception that many have of professional surfers and the lives they lead. However, what is many times unseen is a different image, one of hard work and perseverance, one of immense pressure and disappointment, and one that actually reaches into the actual persona of a pro surfer. Bede Durbidge is seeking to change that. If you want to see just what the life of a pro surfer is all about as they make their way throughout the year, take the opportunity to read Bede’s Blog. It just may change everything you though you knew about what it’d like in the life of a professional surfer. Posted by Shaun	on Friday, July 25th, 2008	in Surfing. -Komunity Project welcomes Alek Parker to the Surf Team. I agree Brent. There is definitely more than meets the eye with being a pro surfer. While much of the benefits seem very appealing, there are issues behind the scenes that would be tough to deal with. Thanks for the love and keep ripping!